The signals are flying fast and furiously. Everybody's on the same frequency; overhead drones transmitting surveillance data, operators on the ground and commanders in the field — and because everyone is on a congested frequency, what should be near-instantaneous transmissions slow as the seconds tick by. On the battlefield, those seconds can mean the difference between success and failure. The answer could be X-Net, a new radio communications system from Raytheon that autonomously and instantly selects the optimal radio frequency to keep communications flowing. 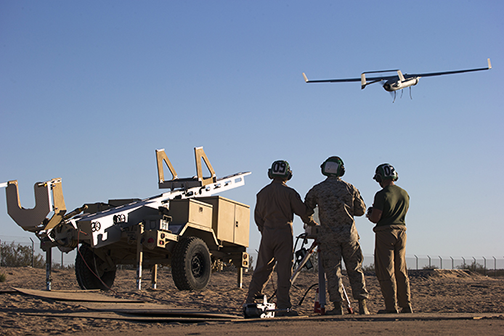 X-Net, a new radio communications system that autonomously and instantly selects the optimal radio frequency for operations, recently demonstrated capability on a RQ-21A Blackjack. Here, a RQ-21A Blackjack is shown being launched into flight. Photo is courtesy of the U.S. Marine Corps. The radio, which is designed for use with missiles, stand-off precision guided munitions and small unmanned autonomous systems, connects host platforms to the tactical network and made its debut earlier this year at a demonstration hosted by the U.S. Air Force Research Lab and the U.S. Navy. During the demonstration, dubbed ESCAPE, Raytheon swapped out two existing radios on a Navy RQ-21A Blackjack for the company's X-Net system. Its mission was to allow the host platform to freely operate in a dense signal environment and conduct its intelligence, surveillance and reconnaissance mission. X-Net performed the flight control operations and video transmission job of the legacy radios, and also allowed the Blackjack to flip its own switch to the best radio frequency for operations. In fact, it continuously hopped radio signals to avoid busy frequencies. As more platforms connect to communications networks, it will be vital to keep frequency space optimized for military operations, where information must quickly be shared. Now that X-Net has proven it can work in congested environments, this technology could be an option for use in contested environments and could, potentially, thwart an enemy’s attempts to jam crucial radio frequencies. David Duran, a Raytheon engineer and a member of the demonstration team, added that frequencies were being jumped often because of the different emitters that were out there — not once was a call received or heard from anyone that any of the communications were being stepped on. Steve Brown, mission systems lead for RQ-21A Blackjack, noted that this was a valuable opportunity to demonstrate new mission capabilities, such as mesh network radios with dynamic spectrum access like the X-Net Radio, into the RQ-21A, which will lead to significant improvements in battlefield communications,. Barbara Borgonovi, VP of Raytheon Integrated Communication Systems, said the company has already seen examples of adversaries trying to disrupt or completely destroy this information advantage on the battlefield. X-Net is a part of a solution to make sure those attacks never work.